It may have been the location amidst a cluster of stone huts on a gentle grassy pasture surrounded by the hard granite rocks of the Picos de Europa; it may have been the idea that wolves and vultures could be watching us from on high as we tucked into a simple al fresco lunch; it may have been the thrill of eating a cheese that had just been taken from a cave where it had been maturing two months. Whatever the reason, for the second time in my life I was in blue cheese Nirvana. Although I’m a fan of most types of cheese, I’ve never been able to make friends with blue cheeses even though I prefer cheeses with a strong personality. 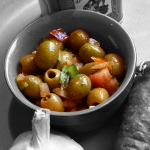 Blue cheese is one of those foods that is a bit like olives, people either love it or hate it. Often there’s no in-between. 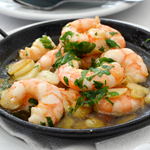 I’ve tried and tried over the years to develop a taste, but the flavours have just never done it for me at all – they generally cross a line into pungency that have my taste-buds holding up a white flag. 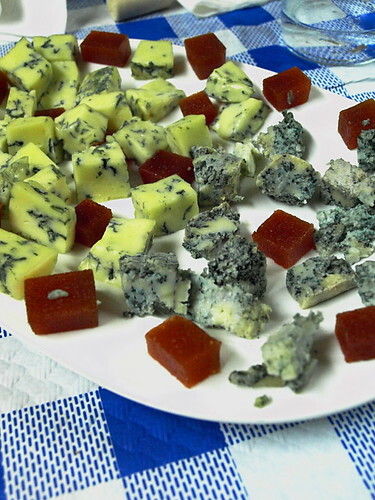 That was until I tasted blue cheese in Asturias. I said it was the second time that a blue cheese had surprised my taste-buds by having a flavour that had them applauding. The first time had been the previous night in Sidrería Casa Lin in Avilés. After a feast that included scorpion fish pate, hake tortilla and navajas (razor fish) I was faced with a plate of Cabrales – one of the most famous of blue cheeses in Asturias and in Spain. The blue seams in the cheese had merged so that the cubes lacked any cream or yellow colouring at all, only varying shades of blue. 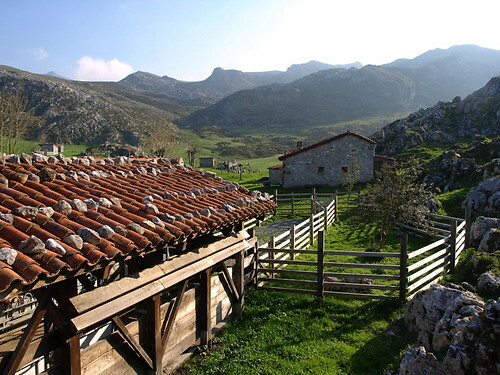 Cabrales is produced with milk from cows, sheep or goats that roam exclusively in the Picos de Europa. It’s made with unpasteurised milk, salted and matured on wooden trays in caves for up to five months until it becomes a single mass of blue veins. With an aged blue-grey appearance you’d expect it to pack a punch to the back of the throat…and it does, but one that is softened by a creamy texture. It’s strong and hot, but not harsh. Flavoursome rather than pungent. Combined with a cube of sweet membrillo (quince jelly) it was a revelation. The Cabrales had opened my mind to what I’d been missing by avoiding blue cheeses. So when the following day we headed into the Picos de Europa to meet local shepherd and cheese-maker Enrique, I was looking forward to getting to know more of my newest best friends in the cheese world. 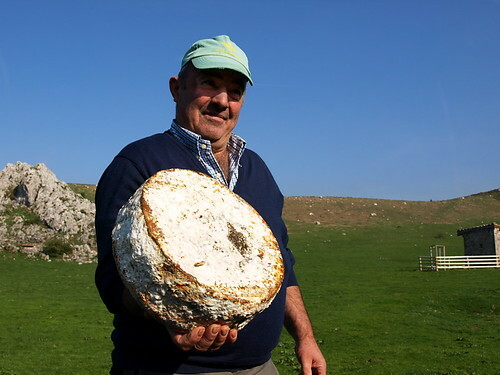 Enrique is one of only a handful of traditional shepherds and cheese-makers left in the Cangas de Onis area. A diminishing population in the villages and the constant battle against wolf attacks makes life for people like Enrique increasingly difficult. But thankfully their passion for what they do continues to motivate them to tend their herds and create Gamoneu cheese in a location whose beauty may have visiting walkers purring with pleasure but one that can also be harsh and unforgiving. On a warm, sunny day, the setting is seductive…when the cloud and rain envelopes the valley with a cold wet shroud, creating cover for the valley’s predators, it’s a different scene altogether. 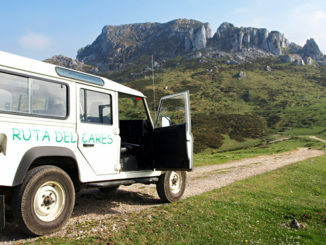 Gamoneu cheese is prepared by local artisans like Enrique who make the cheese with milk freshly taken from their herd. The cheese is seasoned and left to settle in a hut for a couple of weeks before being transferred to a cave until it matures into a car tyre sized round with a ruddy rind covered by a snowy white fungus. When cut it isn’t blue through like Cabrales, instead the blue veins congregate around the edge leaving a pale yellow interior. I’ve yet to taste Gamoneu in a setting that didn’t include dramatic snow clad peaks towering above a grassy spring meadow populated by a few sheep and a handful of quaint stone huts, so don’t know whether Gamoneu’s smoky, slightly nutty and even a tad spicy flavours would seduce my mouth with the same intensity in lesser surroundings. 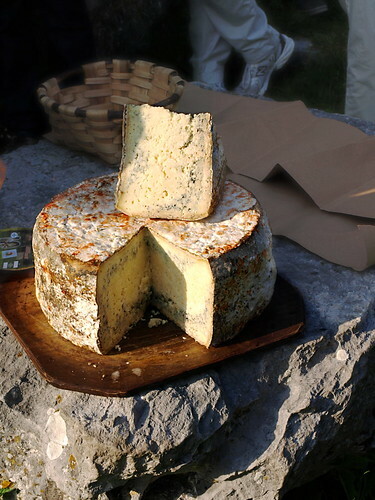 But, aided and abetted by Cabrales, its full-on flavours have completely changed my opinion of blue cheese forever. 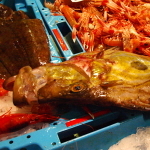 Buzz Trips visited Avilés as a guest of the Asturias Tourism Board. 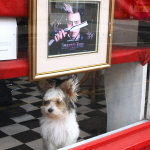 However, the thoughts are purely mine.